I have forgotten to say that there were found in this ambergris, certain hard, round, bony plates, which at first Stubb thought might be sailors' trowsers buttons; but it afterwards turned out that they were nothing, more than pieces of small squid bones embalmed in that manner. Now that the incorruption of this most fragrant ambergris should be found in the heart of such decay; is this nothing? Bethink thee of that saying of St. Paul in Corinthians, about corruption and incorruption; how that we are sown in dishonor, but raised in glory. And likewise call to mind that saying of Paracelsus about what it is that maketh the best musk. Also forget not the strange fact that of all things of ill-savor, Cologne-water, in its rudimental manufacturing stages, is the worst. I opine, that it is plainly traceable to the first arrival of the Greenland whaling ships in London, more than two centuries ago. Because those whalemen did not then, and do not now, try out their oil at sea as the Southern ships have always done; but cutting up the fresh blubber in small bits, thrust it through the bung holes of large casks, and carry it home in that manner; the shortness of the season in those Icy Seas, and the sudden and violent storms to which they are exposed, forbidding any other course. The consequence is, that upon breaking into the hold, and unloading one of these whale cemeteries, in the Greenland dock, a savor is given forth somewhat similar to that arising from excavating an old city graveyard, for the foundations of a Lying-in Hospital. I partly surmise also, that this wicked charge against whalers may be likewise imputed to the existence on the coast of Greenland, in former times, of a Dutch village called Schmerenburgh or Smeerenberg, which latter name is the one used by the learned Fogo Von Slack, in his great work on Smells, a text-book on that subject. As its name imports (smeer, fat; berg, to put up), this village was founded in order to afford a place for the blubber of the Dutch whale fleet to be tried out, without being taken home to Holland for that purpose. It was a collection of furnaces, fat-kettles, and oil sheds; and when the works were in full operation certainly gave forth no very pleasant savor. 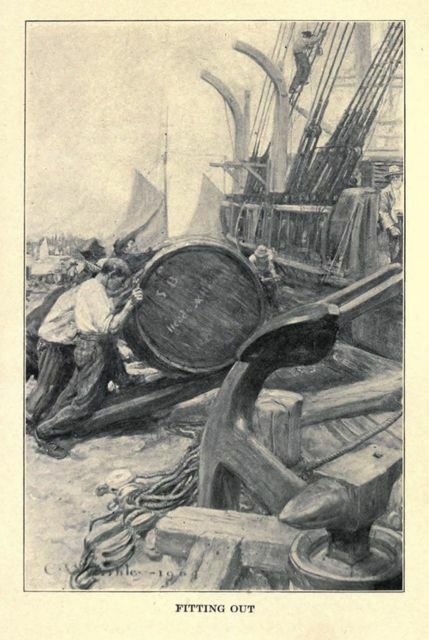 But all this is quite different with a South Sea Sperm Whaler; which in a voyage of four years perhaps, after completely filling her hold with oil, does not, perhaps, consume fifty days in the business of boding out; and in the state that it is casked, the oil is nearly scentless. The truth is, that living or dead, if but decently treated, whales as a species are by no means creatures of ill odor; nor can whalemen be recognised, as the people of the middle ages affected to detect a Jew in the company, by the nose. Nor indeed can the whale possibly be otherwise than fragrant, when, as a general thing, he enjoys such high health; taking abundance of exercise; always out of doors; though, it is true, seldom in the open air. I say, that the motion of a Sperm Whale's flukes above water dispenses a perfume, as when a musk-scented lady rustles her dress in a warm parlor. What then shall I liken the Sperm Whale to for fragrance, considering his magnitude? Must it not be to that famous elephant, with jeweled tusks, and redolent with myrrh, which was led out of an Indian town to do honor to Alexander the Great?